Description: This SD70M-2 leads this slab train west on #1. Description: Lone NS SD70M-2 powers general freight 34M west one 1 of the Harrisburg through this curve at Birdsboro. Description: NS general freight that today is made up of mostly empty gons cruises west through the "s" curve at Birdsboro behind solo SD70M-2 2684 on a bright morning. Description: NS 19G westbound @ 932 hrs. Description: A side view of the NS SD70M-2 and SD70. Description: NS SD70M-2 2684 leads SD70 2508 with train 19G. Description: Westbound on track two passing the signals at CP homer. Title: Sun Finally Breaks Out as WB 11J Rolls Into Town @ 1036 hrs. Description: Due to a problem with air pressure on the lead engine, these two engines and their consist of empty covered hoppers blocked the Saginaw Interlocker for almost 45-55 minutes. Description: Newly reworked eastern interlocking at CP Bird ushers in westbound NS ballast train 917 onto the turkey path at Birdsboro behind a pair of horsehead units. Description: NS ballast train 917 sits on the turkey path main as the crew is in the loco at the back right to bring more hoppers out of Dyers Quarry to add to the train. Trouble was, HBG East called them and told the crew to forget it; they are to take the 15 cars they already had picked up at Cromby and take them to Harrisburg. Wasting time and fuel, eh? Description: Unsure of the train's I.D. 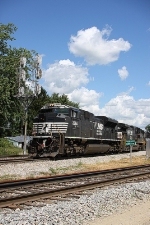 but this Southbound is rolling through Norfolk Southern's Gest Street Yard in Cincinnati, Ohio. Description: NS 2684 and what I think is Train 171 westbound at Main Street.